Guests will be treated to craft beers, artisan cocktails and a sampling of seasonal appetisers and sweets at the launch of Public School 404 Restaurant and Bar. Tickets cost $35, all proceeds going towards Parkinson’s research. An annual event centred around bartending competitions, high quality food and silent auctions. The occasion is in aid of The Michael J Fox Foundation and to date has raised almost $2,000,000. The National Parkinson’s Foundation’s annual fundraising walk or run event aiming to unite families, friends and the wider community in the fight against Parkinson’s. Team Fox will be competing in the Rock the Ridge challenge, taking place at the Mohonk Preserve. The event caters for all abilities, from hikers to marathon runners, and participants can take part individually or as a team. The conference will comprise of a combination of workshops addressing Parkinson’s issues ranging from collaborative patient-provider relationships to the comorbidities of the condition. The conference, held at the University of Barcelona, will provide an update on essential aspects of the various synucleinopathies. Why not kick start summer with a nine-mile sponsored walk of Mount Snowden? The event offers the chance to experience stunning views while raising money for Parkinson’s. Parkinson Society British Columbia will be hosting a full-day workshop focusing on communication and swallowing challenges faced by those living with Parkinson’s. Domino’s Pizza will be donating 5p from every pizza ordered in the United Kingdom to Parkinson’s UK. So make sure you add this guilt-free takeaway night to your diary. The Danish Parkinson’s Association are inviting guests to join them on their annual Unity Walk where they will march from Nytorv to Højbro Plads. The walk aims to highlight the importance of a positive outlook and regular exercise. Parkinson’s UK invite Parkinson’s supporters to raise money for the charity by strapping themselves to the top of the wing of a Boeing Stearman plane. The London Vitality 10,000 is a 10km run that starts and finishes in St James Park, London. 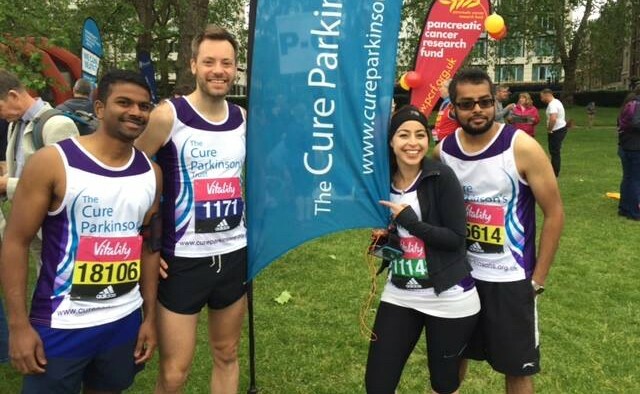 The Cure Parkinson’s Trust will have a team competing in the event, offering a running vest, fundraising materials and a cheering area near the finish line. To mark the 60th anniversary of both the Parkinson’s Disease Foundation and The National Parkinson’s Foundation, guests can enjoy a night of dinner and dancing at New York Botanical Garden.